Vice Presidential candidate of the PDP has described as sad, the continued reverse movement of Nigeria from better to worse rather than the other way round. Obi made this observations yesterday at the inauguration of Prof. Chike Obi Lecture Series by the Alumni of University of Nigeria, Onitsha branch. Regretting that Nigeria has failed to achieve her potentials within the dreams of her nationalists, including the likes of Prof. Chike Obi, Obi said that the coming general election was yet another opportunity for the people of the country to vote in those with proven records in resource and human management. Reflecting on what he called the "misplacement of values", Obi said it was sad that Nigeria had over the years bred people without respect for education and professionalism. He recalled how, when he travelled to Kenya, people he met were excited that he was coming from the county of the likes of Prof. Chinua Achebe, Prof. Wole Soyinka and Prof. Chinua Achebe. "Today, due to the ascendancy of thuggery, our people have little regard for scholarship. Today, touts in the parks earn more than professors and yet nobody is raising alarm. 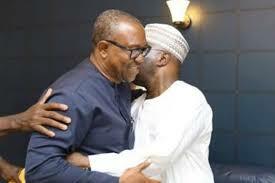 I have had extensive discussion with the PDP Presidential candidate, Alhaji Abubakar Atiku and I am happy he is concerned about the phenomenon, which was one of the reasons he founded an University and has commmitted a lot of resources to education even as a private citizen", Obi said. Bemoaning the degeneration of Nigeria, Obi said that now was the time for Nigerians to ask a lot of questions as stakeholders in the business of development of the country. His words: "How many of us are aware that in 2007, Nigeria was not owing a kobo, but today we are owing over 80 billion Dollars? How many of us are aware that Nigeria has the highest number of out-of-school children? How many of us know that Nigeria today has the highest number of poor people in the world? Obi said that such questions were asked by the likes of Chike Obi at their younger ages and called on the youth of Nigeria to ask the same question and insist on being answered.